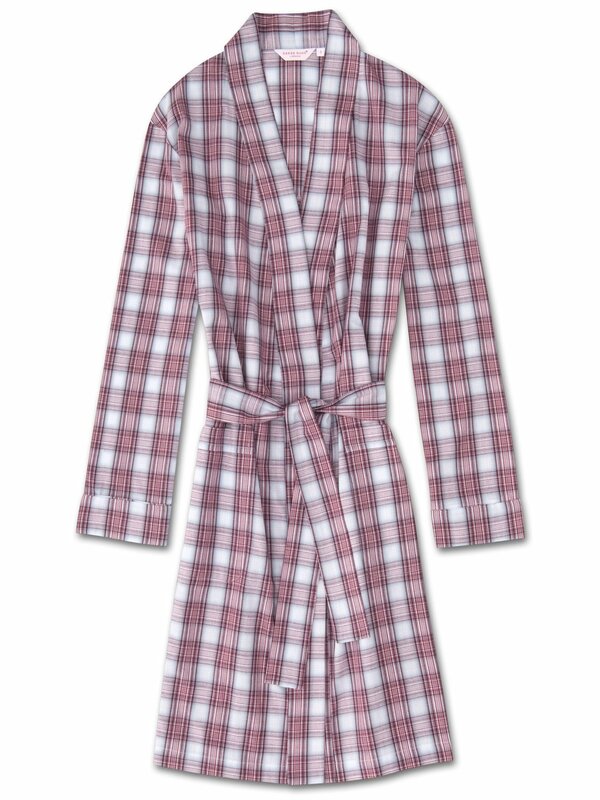 A classic check is updated into a fresh design with burgundy, pink and grey stripes that form into a checked pattern and ensure this dressing gown will remain in your lounging wardrobe for years to come. Designed for a relaxed but flattering and elegant shape, our women's dressing gowns will keep you looking great and feeling comfortable throughout the seasons. Made from a regular, mid-weight 100% cotton, the Ranga 34 fabric is brushed using a unique technique for unbelievable softness and warmth without being heavy or bulky. Cut for a relaxed fit, you can layer this gown comfortably over pyjamas or loungewear throughout the year. With its brushed cotton fabric, the Ranga 34 is luxuriously comfortable and an ideal layering piece. The knee length style features two front patch pockets and a self-fabric kimono style collar, cuffs and waist-tie for an effortlessly stylish finish.